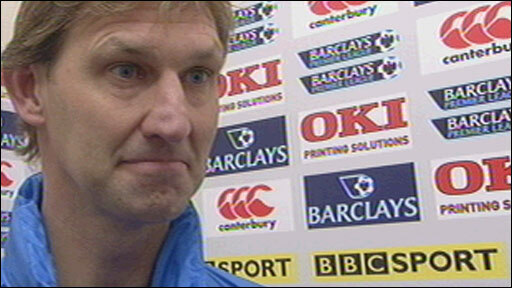 Emile Heskey's injury-time winner for Wigan left Tony Adams looking for his first point as Portsmouth boss. Heskey's 100th Premier League goal from Lee Cattermole's pass settled an incredible game where Pompey hit the woodwork no less than five times. Amr Zaki fired the Latics ahead from the penalty spot after Papa Bouba Diop fouled Titus Bramble. Wigan's goal lived a charmed life before substitute Niko Kranjcar looked to have saved a point for Pompey. Portsmouth had some early defending to do when Nadir Belhadj fouled Luis Antonio Valencia and after the home defence failed to deal with the initial free-kick Lee Cattermole's cross found Zaki whose header looped inches wide with David James floundering. Wigan enjoyed a good spell of early pressure and Valencia's shot was parried by James and the England keeper recovered to snaffle the rebound as Zaki looked to pounce on any crumbs. In dreadful conditions Pompey clawed their way back into the game, but it was 13 minutes before Glen Johnson put their first shot on target, curling a weak effort into keeper Chris Kirkland's arms from 18 yards. Peter Crouch went even closer three minutes later when Kirkland could only watch as the England striker bounced a looping header onto the top of the crossbar, with Papa Bouba Diop hooking the loose ball wide. Jermain Defoe's cute and clever movement saw him latch on to a loose ball in the inside-right channel but the angle proved too tight as the Pompey striker slammed his shot into the side-netting. A goal glut did not look on the cards, with Pompey having scored only 10 Premier League goals and Wigan one more, and Portsmouth twice failed to capitalise on promising situations with Lassana Diarra and Defoe failing to hit the target from free-kicks. The woodwork came to Wigan's rescue again as half-time approached. Bouba Diop met a corner with a powerful header but Wilson Palacios was on sentry duty on the line, heading the ball up on to his own crossbar. At the other end James spilled a routine cross from Valencia but there was no Wigan player on hand to cash in. On the stroke of half-time Wigan took the lead when Bouba Diop's mis-timed challenge on Bramble saw him concede his second penalty of the week, with Zaki making no mistake from the spot. Pompey threw on Kranjcar at the start of the second half and he almost made an immediate impact, firing a free-kick through the Wigan wall, only to see Palacios hook the ball off the line. Defoe then missed his kick in front of goal after Diop pulled the ball back and Crouch rose to glance a header inches wide as Pompey stepped up their search for an equaliser. Portsmouth had an even better chance on the hour when referee Peter Walton ruled Kirkland handled a back pass eight yards out. With every Wigan player back on the goal-line the ball was rolled to Defoe whose shot was scraped off the line by a combination of Emmerson Boyce and Heskey. In a rare Wigan raid, the ball fell invitingly to Zaki who had time to steady himself but instead blasted a first-time shot high into the stands. Wigan's goal was living a charmed life, with Johnson crashing a header against the bar from a corner, and when another cross followed in quick succession Crouch rose to plant another header against the woodwork. Portsmouth's pressure eventually took its toll and when Belhadj's cross dropped for Kranjcar, the Croat fired through his shot through a ruck of players. Incredibly, Wigan came forward to steal all the points, with Heskey latching on to Cattermole's pass in the inside-right channel to slot home past James. 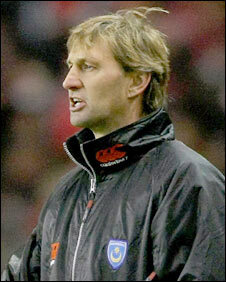 "I went berserk at the players and realised I shouldn't have done that because they had given me so much passion. "I kicked a few bottles in there because it seems too much is happening to me in the early stage of my management career. "But I know I've got a talented team and we will bounce back from this." "We've had more luck today than in any of the previous four, but we could have won it before we did. "When you get games like that it can give you heart attacks even if you've got an array of talent like Tony has. "Yes, welcome to the wonderful world of management, he must be nuts but I'm sure he'll do well." Portsmouth: James, Johnson, Campbell, Distin, Belhadj (Pamarot 90), Diop (Utaka 73), Diarra, Davis, Armand Traore (Kranjcar 46), Crouch, Defoe. Subs Not Used: Ashdown, Kaboul, Hughes, Kanu. 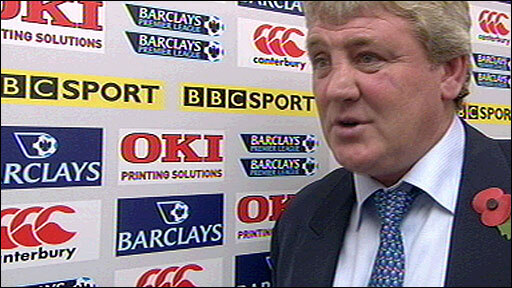 Wigan: Kirkland, Melchiot, Bramble, Boyce, Figueroa, Valencia, Palacios, Cattermole, Koumas, Heskey, Zaki (Camara 89). Subs Not Used: Pollitt, Taylor, Scharner, Kilbane, Brown, De Ridder. Goals: Zaki 45 pen, Heskey 90. 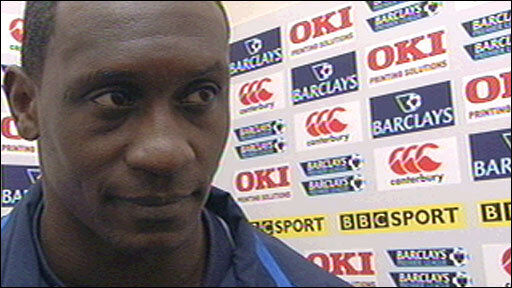 BBC Sport Player Rater man of the match on 90 minutes: Wigan's Zaki - 8.40 (on 90 minutes).